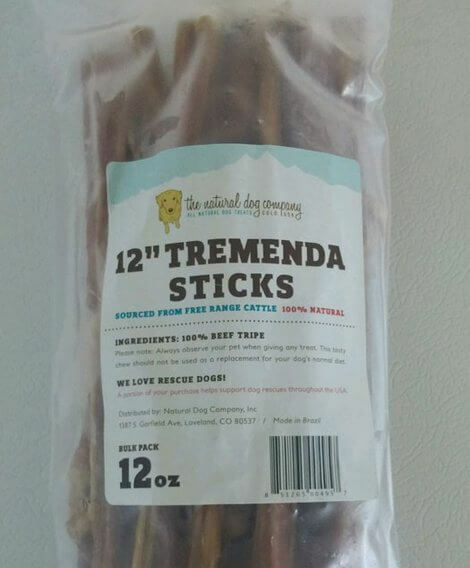 July 20, 2015 -– The Natural Dog Company of Windsor, Colorado, is recalling its 12″ Tremenda Sticks pet chews because they have the potential to be contaminated with Salmonella. Products with new packaging — which includes both a lot number and expiration date but the same UPC — are not affected by this recall. The potential for contamination was noted after a Colorado Department of Agriculture inspection of the product revealed the presence of Salmonella in a sample taken from a 12oz package of 12″ Tremenda Sticks. Consumers who have purchased 12oz packages of 12″ Tremenda Sticks should discontinue use of the product. Customers may return the unused portion to the place of purchase for a full refund. Those with questions may contact the company at 888-424-4602, Monday through Friday 9am to 5pm MT.